Original Head Length : 10"11"12"Standard 9 1/4"
This mallet is made by world renowned mallet maker George Wood and has proved a firm favourite as club mallets and with club players of all standards. The mallet heads are made from South American Massa which is extremely hard, dense and stable. It carries independent 'FSC Pure'certification that it's sourced from 100% legal and well managed forests. The timber is kiln dried timber and has an inlaid sightingline and ‘Tufnol’ end plates fitted. These end plates are virtually unbreakable and provide a crisp and true surface for striking the ball. 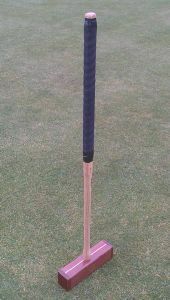 The standard mallet head; length 9 1/4" (23.5cm), wide 2 3/8"(6.0cm), height 2 1/2" (6.5cm). Longer Head lengths 10",11" and 12" can be ordered but will incur an additional £10.00 charge. Made of selected clear American White Ash, the lower half of the handle is turned on a copy lathe and the top half is hand shaped to a positive and traditional octagonal pattern. The standard size is 25 mm x 30 mm. We supply a black rubber cushion grip to the handle. If you wish to order a mallet with a non-standard head length please select the required head length from the drop down list. Select the length of mallet for your mallet: Overall lengths from 32” up to 38”. Longer lengths up to 42" involves splicing to extend the handle and will be £30.00 extra. For additional information on choosing a mallet please go to the 'Choosing a Mallet' page or contact us to discuss your requirements.